school in Balikpapan, the Republic of Indonesia, in 2016. We received a thank you letter from one of the school students. In addition, the story was featured in a local newspaper. express my feeling and just say thank you. The new one is very comfortable and I am growing to be very fond of it! The new one is not only cozy, but also easy to use. Without a wheelcair, I can’t go anywhere, even to school. The wheelchair has become “my legs”. gave up their time to deliver the wheelchairs to the school. 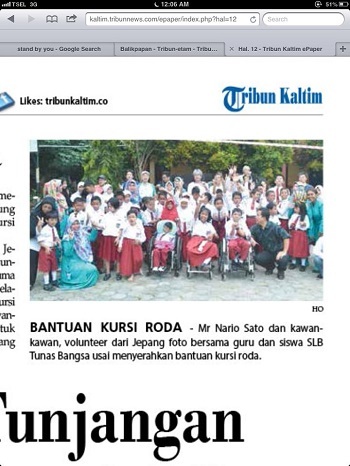 already received 10 wheelchairs, so now the total number of received wheelchairs becomes 15! by those in the national special school. delivery of wheelchairs through Go!Fly!Wheelchairs, the NPO. Through their work, they provide both the joy of receiving wheelchairs and the sense of safety by durabililty through their maintenace work. We also wish to stress our thanks for them.